Mrs. Moore is the 4th grade teacher at Calvary lutheran School. 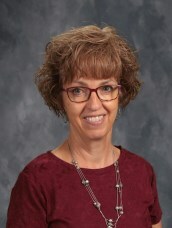 Kimberly graduated from Concordia in Seward, Nebraska, with a degree in Elementary Education, with a concentration in Early Childhood Education and a minor in Speech and Drama She has been teaching for 34 years, while serving in many places including California, Las Vegas and Indiana. Kimberly and her husband John have two sons, Zachary and Nathaniel. Daughter-in-law Elizabeth was added to the family almost 2 years ago when she married Zach. She feels very fortunate and blessed to be able to teach at a school where she can share Jesus’s love everyday with the students. In her free time she enjoys reading, baking, gardening and traveling.